Where can a gardener find safe mulch… for free… in this crazy world? Do you have any resources for getting free mulch delivered to your house from tree trimmers or someplace else? What do you think about that idea? Diseased trees, lead, other toxins, allelopathic trees/plants concern me somewhat. I spent a little time trying to google if allelopathic trees are common in my area to see if it’d be a concern in free mulch I may find. I didn’t find much information. First I’ll cover where to get free mulch. City mulch supplies are a mixed bag for sure. When I lived in the town of Smyrna, TN (may it be consumed by a volcano and/or swarms of demonic locusts), I got an entire dump truck load of mulch delivered from the municipal waste facility in the neighboring city of Murfreesboro. There was some trash in it we had to pick out, but overall it was great stuff and the gardens thrived on it. That was almost ten years ago, however, and before the scourge of aminopyralid became common. Diseases and invasive species can also find their way to your property via municipal mulch supplies. The main reason is because lots of people contribute to the municipal yard waste recycling program… and some of those people are less careful than others. When raking and bagging your yard, it’s easy enough to end up with the occasional beer can in the pile of pine needles… or some candy wrappers… or a Budweiser bottle. And that’s just the inorganic stuff. It’s a pain (sometimes literally) to find shards of metal or glass in your garden, but it’s not a big deal compared to some of the chemicals you may encounter. I tend to be pretty lax with the organic material I allow into my garden. I’m not that scared of invasive species or plant diseases, since I garden in an anarchistic and very dense manner. There are lots of checks and balances in the ecosystems I create, so if something finds its way, it’s not likely to overrun everything. What I am scared of are persistent herbicides. After my nasty run-in with Grazon(TM) a few years ago, I look sideways at anything that might contain that nasty plant-destroying poison. Fortunately, it’s most common in manure, hay and straw, which are not typically components of yard waste. Yeah, I don’t like that kind of thing. Lawns are pretty toxic places in America. I’ve found the best source for mulch is the tree companies that prune along the powerlines. That’s where I got about six loads of good stuff for my food forest, and I knew exactly what was in it. Pines, oaks, hickory, cabbage palms, wild grape vines – all the wild stuff that grew along the edge of the road – and no grass clippings! 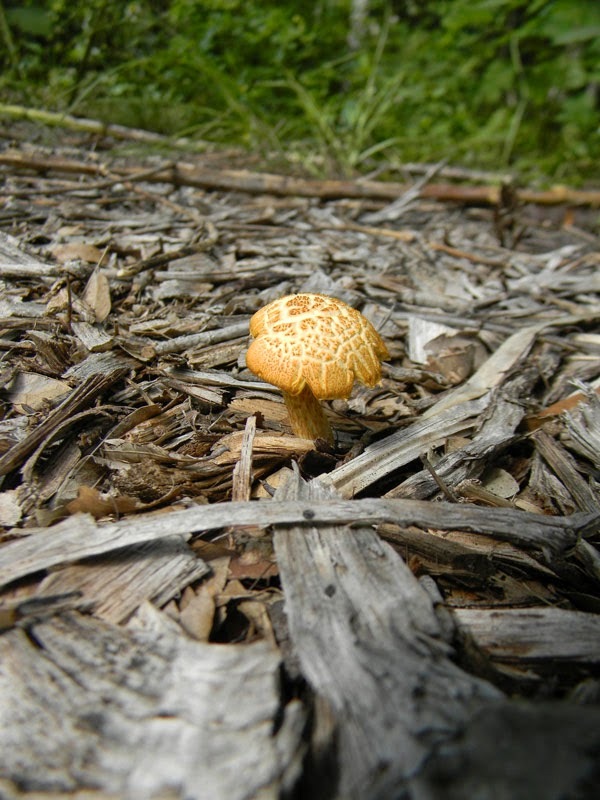 As a side benefit, mushrooms love turning that tree mulch into soil. The second source I’ve found for mulch is more of a pain to gather, but worth it. Leaves and yard waste that haven’t been picked up by the city yet but are beside the road = fair game! I’ll look in the tops of bagged leaves to see if the bags contain grass clippings. If they don’t, I nab them. Just a couple of days ago I also dragged a green yard waste bin into my Dad’s backyard to add the contents around the fruit trees in the food forest. It was filled with pine needles, some hardwood leaves and some pine cones. Good stuff, once I picked out a few pieces of trash from the bottom. When I see neighbors trimming their trees, I ask for the logs and the leaves. Though they break down slowly and aren’t great for mulching, they are excellent sources of long-term fertility for the garden. I put random chunks of logs right around fruit trees and buried into garden beds as moisture/mineral sources and fungi repositories. I’ve even had good luck with leaving a big pile of rough sticks and leaves in my yard to rot, them stomping it down into usable mulch a couple years later after it rotted enough to become brittle. I’ve mixed a bunch of different species together into my compost piles without paying much attention and have never seen any issues. I didn’t add black walnut, granted, but I’ve read that some of the species that grow in my neighborhood and were in the mulch dropped on my food forest were allelopathic… but again, it was a big mix of stuff. Nature sorted it out for me. I have a feeling that small to moderate amounts of allelopathic trees won’t make much difference in your gardening. It might even be good for it. Plant homeopathy? Abouttrees.com seems like a good idea if it works. I haven’t had any experience with them, but it doesn’t look like a scam so far as I can tell. “Mark is an arborist that REALLY love tinkering with computers too! For the past fifteen years he wasted thousands of gallons of fuel hauling wood chip mulch, a valuable byproduct of his business, across the city only to dump it in landfills. Neighbors would often come up to him requesting it, but many times he would have to knock on doors to see who wanted it. (Mark really didn’t like that part…)On hot Georgia days, covered in sweat and sawdust and breathing the fumes of that non-air conditioned chipper truck, Mark had plenty of time to think how much fuel he was wasting to get those loads of mulch to the dump. Even worse was that he knew that there were people close by that would want it but he didn’t know who they were because he only had access to his own list of wood chip requests, and not the list of other tree services.And even more frustrating was when he finally was working in an area where people had called in to request mulch, the majority of times they already had their request filled by a someone else.He felt there had to be a better way. He finally saw real the problem. MULTIPLE LISTS!He saw that tree services maintaining their own separate list was a HUGE waste of time, not only for the tree services, but also for the client who had to make tons of phone calls to tons of tree services for only one single delivery. The problem with ideas like this is getting enough people to sign on. Why not try and see? It seems like a rather elaborate and niche to be scam – I can’t imagine the benefit to the scammer. Unless he’s a psycho-killer who really has a thing against organic gardeners. Tomorrow I’ll be back with some great photos from Wendy’s garden in St. Petersburg. It’s beautiful and you’re going to love it. I love tree trimming company wood chips. We live on 2 and half acres. I figure that I have had about 40 to 50 loads of the stuff deliver over the past 5 or so years. My word of advice, once you find someone that will come regularly to give you this great stuff be very careful before you tell them to stop. I wish I had kept my big mouth shut and let them keep bringing the stuff, because finding some else that will bring it on a regular basis can be tough. So why did I do it? Because I had loads of the stuff just sitting in the yard.. looking ugly to the neighbors… you see then the costly part… hiring someone with a bob cat to spread it around. That cost me about 300 bucks last year. It was worth it though, he spread about 20 loads of mulch in about half a day. Before that episode, my live in inlaws spread about 10 to 15 loads by hand… and wheel barrow. Now I again have about 7 or 8 loads sitting in the yard. I am waiting for another10 to 15 before it is worth it to hire another bob cat guy. It takes a lot of woodchips to do an area a foot deep. I am very excited about my little woodchip food forest, that I have been planting for the past 3 or 4 months. They have not decomposed for much to grow without some soil amendments, so I have been putting a few inches of mushroom compost in some areas and planting there. My eventual goal is to have literally tons of woodchips…. I hating mowing grass!!!! and summer is fast approaching. It wont happen this year… but eventually. Sorry… this got long… I am still half asleep… bottom line… woodchips great…when you see the companies working… stop and talk to them.. ask them… I have got some for free but found out they will keep coming back if you give them a little bit of money 10 bucks or so… your call… don’t say no to more chips unless you are absolutely sure… a regular supplier of woodchips are sometimes hard to find… realize the real expense is spreading them around… unless you are going to do it yourself…which is a ton of time and energy . but to each his own…….WOODCHIP GARDEN….YES! Free Chips!!!!!! Not in my neck of the woods and I live in Washington State. When I hear the sound of a chainsaw & chipper I follow it and see if the chip has a buyer, if not, I pay the price. There’s one tree service that charges a $100 bucks a load. He actually tried to tell me how much better his wood chips were from other wood chips. I’ve put in about 130 yards of chip in 5 years, that’s hand-bucket hauling. Just wish I had a out-of-way place they could dump more on. My neighbor’s are tolerant but last year I got a truck load of fresh downed & chipped cedar and had to let it sit a bit. Got a complaint and had to get it spread and it burned out a lot of plants in my front yard. Oh well, I live in the back yard, the front yard is for the deer, rabbits and intolerant Round-Up spraying neighbors. Does fresh mulch have to “cure” a bit before spreading? Is it like manure in that way? I’ve found you can use the wood chips straight away as mulch for trees or ground cover. If it sits for a couple days wear a dust mask when you spread it since saw dust particles get moldy fast and can cause lung problems. Legumes grow readily from scattered seed on the mulch. But for other garden plants its better to let it sit for a year so fungi can break it down making more nutrients available. That last load was 100% fresh chipped Cedar and was heavy with pitch (sap). It sat for about 6 months but the center of the pile was still very strong and did burn certain plants. One thing I noticed was this spring the snail & slug population was greatly diminished. Now I have that scene from Fargo playing in my brain. Thanks David! Hi Wendy. We live south of Sarasota FL. I, too, was on the hunt for wood mulch…oak mulch and only oak mulch. I started by doing a search to find out if any one in my ‘hood operated a tree trimming business. Good place to start – neighbors. I then started calling local tree trimmers, not landscapers, but tree trimmers. Landscapers do not usually own a wood chipper. I then called the tree trimmers and told them that I was interested in mulch…..100% oak mulch. No pine, no palmettos, no Brazilian peppers, nothing but 100% oak mulch. I asked to be put on their list for oak mulch when they are in my area. I give them a pretty good landmark – near x beach or the intersection of x and y. I usually call again in 30 days or so to keep my name and number fresh in their minds. I also tell them that my property is easy to find and that I can clearly mark where to dump the mulch (in case I am not there). I’ve since learned these guys don’t want to wait around for you to get home. They want to dump when they want to dump. I have also learned that they are paying ~$100 to drop their truck load at the local dump. So I gently remind them that by dumping at my property I can save them fees, mileage and time. They already know that, of course. I have not tried to call the guys who trim for the local power company. They have all manner of stuff in their loads that I personally do not want. I’m not fussy but my garden is within view of the neighbor and the lot is only 3/4 acre so I try to keep the ‘chaos’ to a minimum. The oak mulch looks like something you’d buy in bags at the local nursery. I also called my county administration to find out who the arborist is. Give him or her a call and tell them what you want. They can usually hook you up with the guys who do the giant oak trees because the arborist is often called in to evaluate grand oaks and such. I always finish my conversations with these guys by saying I only want 100% mulch. I don’t want to disparage tree trimmers but be careful so they don’t dump their junk at your property. Oak mulch is a thing of beauty – chunky and light weight. Yummy stuff. I offer the driver $20 for lunch and it usually isn’t long before I get another call about mulch. Like others, I have also stopped and talked to these guys when I see them trimming and chipping oak trees. I keep my eye out for oaks with a ribbon tied around the trunk which means it may soon by coming down. Additionally, I note neighborhoods with lots of large oaks on site. When there’s a big storm I cruise the area since there may be damage and trimmers soon flowing into the area. I have an approximate 40ft. x 45 ft. space with about a foot and half deep of mulch. I put heavy cardboard down first (appliance or furniture stores for big, heavy duty, little tape cardboard). I keep dumping oak mulch, oak leaves, goat manure, compost….it’s working very well. This has been my experience so I hope it proves helpful. Best wishes. This is an awesome article! As a tree service company in Arizona, we always try to make the most of material we remove from properties. When we grind stumps or remove trees, we always ask the customer if they would like to re-use the wood chips and remaining material for mulch. Most of the time they don’t, but we hold on to it and give it to a local gardener who loves our stuff! I wish more people would use the stuff that is all around them instead of paying for bags at the big box stores.